... and I don't need to feel guilty for staying up late to work on models. The walls don't look like bricks to me at all, but are sized more like cement blocks, so I painted the walls Aged Cement gray. For the rafters I used Leather brown. The window frames are painted in a thin coat of Rust. The outside flooring is painted in Cement, the inside flooring CSX Gray (PollyScale colors). I don't have a nice green tone for the doors at hand, so I left them alone. The outside walls were treated with a light wash of black India Ink in Isopropyl alcohol. 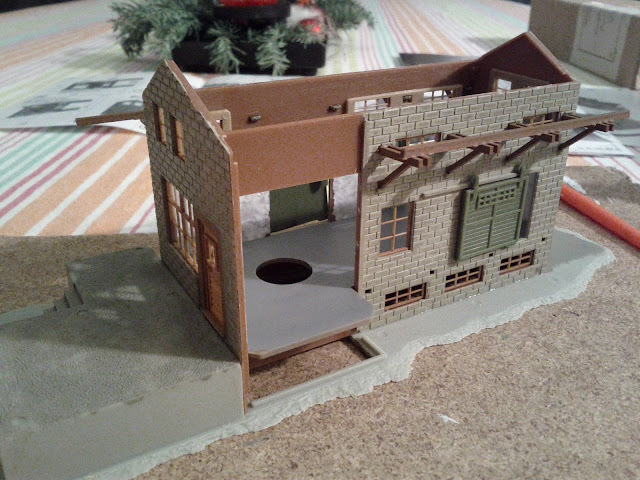 Once I'm completely done with the building, and weathering, I'll seal everything with Dullcote, which will also remove the plastic sheen from the freight doors.